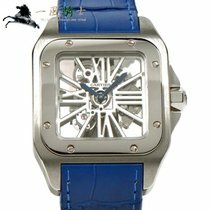 This Cartier Santos 100 XL Skeleton is a part of a very limited production series of Skeleton movement watches. 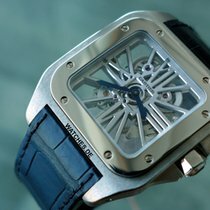 Extra-large and made out of Palladium, it features a true, "see through" skeletonized movement, with bridges that "float" in the air. Palladium is one of the most Hi Tech, and exotic materials in modern watch making. The case has the unmistakable, classic Santos shape. The crocodile strap with adjustable double folding 18K buckle completes the picture.To say it is a work of art is an understatement. 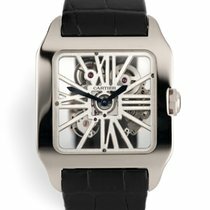 With this watch, Cartier sets the bar for aesthetic, architectural, watch design. This timepiece is in pristine, original, UNPOLISHED condition. It comes with the original, black croco strap as well as a light brown one. This watch is complete with proper Cartier box, manual and warranty booklet. Original retail value is around $60,000.